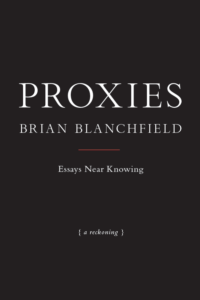 The essays that comprise Brian Blanchfield’s Proxies: Essays Near Knowing adhere to the following constraint, as described by Blanchfield: “a total suppression of recourse to other authoritative sources.” In an introductory note, Blanchfield links this strategy to the Montaignian motto, “Que sais-je?” — what do I know? Though Proxies departs from the method of Montaigne’s Essays — Montaigne quotes others liberally — it bears that work’s skeptical spirit, self-deprecating mood, and strange profundity. Nearly a century after the publication of the Essays, Descartes canonized Montaigne’s wild skepticism into the cold method of radical doubt, while also subverting that skepticism’s shrug at the value of knowledge (“In truth,” writes Montaigne, “knowledge is a great and very useful quality . . . yet I do not set its value at that extreme measure that some attribute to it”) into the deification of certainty. Montaigne doubted, then saw fit to wander pathways of thought, venturing and erring. Descartes doubted in order to construct an edifice of knowledge, thus inaugurating Western philosophical modernity with his declaration of the subject whose being is grounded in thinking, which reaches its perfection in certainty. Blanchfield’s project — don’t worry, not as self-consciously academic as I’ve implied — pitches us back behind Descartes’ certain subject who doubts only as a step to knowing, to a Montaignian roaming, embodied, feeling consciousness. Beyond enabling deep close readings of the idiosyncratic subjects Blanchfield chooses (the constraint, he writes, invites him “to stay with the [essay’s] subject until it gives onto an area of personal uneasiness”), the project’s philosophical underpinning is provocative and timely. Our 21st century constructions of ourselves are perilously entangled with the facts to which we have access. I don’t know half as much as I know how to find out, by knowing the phrase to Google or the Twitter timeline to scroll. In a cultural milieu that relies on our knowing only vaguely, since our access to reliable knowledge feels so secure, Blanchfield’s courting of error becomes a brave and radical attempt to rethink the self. Proxies relies on ventured truths over familiarity with vague regions of the knowable unknown. No wonder, then, that the book brims with references to the subject’s tenuous knowing. Blanchfield doesn’t feign omniscience. On the first page of the first essay, he can’t remember for whom he bought a brick as a gift. He sees an owl: he’s “sure there was an owl.” Yet, a paragraph later: “If there was an owl, it was still” — how quickly the owl’s existence evaporates into mere possibility. In “On Confoundedness,” Blanchfield conjectures (“I’ll bet,” he writes) about where he learned the phrase “confounded to Hell.” He thus recalibrates the Cartesian cogito as a statement of uncertainty that lies at the basis of our being: I mistake, therefore I am. Blanchfield is a poet, so it’s no surprise that his musings on poetry stand out, too. “On Propositionizing” reads Helen Keller’s account of language acquisition to explore language’s power “to propose relationships among things” and to argue that we are “altered constitutively by the ability to put words into play” — and, touchingly, to recount Blanchfield’s falling in love with his partner, John, over the course of John’s revising of a poem. “On Abstractions” considers the necessity, use, and meaning of abstractions in the poetry of Emily Dickinson and others, while “On the Locus Amoenus” contemplates the place where lyric poems occur, the essence of lyric speech, and the question of “whether the poet is different from the person who writes the poems and pays the Comcast bill late again and gets balsamic dressing on the side and snaps at the customer service person at U-Haul headquarters” — that is, the question: who is the poet, anyway? Proxies, though a slim volume, covers extensive ground and erupts with multitudes. It establishes Blanchfield as an innovator of the lyric essay and autobiography and as a key thinker in contemporary poetics, queer theory, and cultural criticism. His prose is dense, idiosyncratic, and often beautiful. Those concerned about the factual inaccuracies endemic to the project may note that the volume’s final twenty pages comprise an essay in non-sequiturs entitled “Correction,” which chronologically corrects the essays’ errors. This final piece arguably serves more as an ancillary touch of experimentation than as clerical cleanup. Regardless, I stopped turning to it after a while and felt no urge to read it through at the end of the book proper. Fact checking and proper citation have their place, of course. But Proxies properly occupies the territory of human erring, and I felt no need to leave it. This book outpaces the cleverness of the constraint that formed it. It’s an elegy for art, friends, and loves; an inquiry into the self and its world; and a needed reminder that knowledge is only truly ours if it’s remembered. And because to remember is always to misremember, Proxies leads the reader to ask: can to know, finally, only ever be to believe?